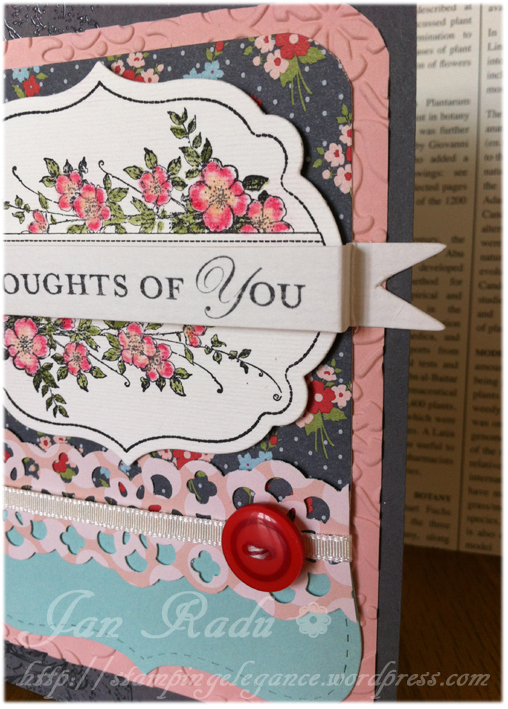 You just can’t get much more useful than a Thoughts of You card – it could be for anything really! I cased this design (kind of) from the New Mini catalogue in terms of the topnote at the bottom, and I like it! To create the banner for my sentiment, I ran my cardstock through my bigshot and the Petal Cone Die – placing the cardstock across the banner section only, and then scored the banner at 1.5cm and again at 2cm from each end. This allows me to fold it along the score lines and attach to the card, and have the card still go into a standard envelope. Another tip for this card is that I have coloured the flowers with my blender pens and Stampin’ Pastels, but the leaves with my Pear Pizazz Stampin Write Marker. It just makes it easier to stay in the lines with the marker! I found myself wondering today “Framelits will you ever leave my craft desk?” and the answer is probably NO until Stampin’ Up! bring out another design for me to play with LOL.